(Nanowerk News) A Brigham Young University physics student and his professor had some fun with their new method of growing tiny machines from carbon molecules. 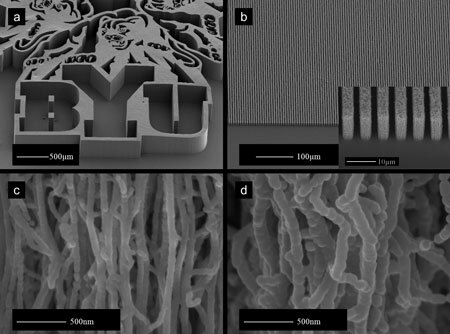 We've seen some creative ways of making tiny BYU logos before, like engraving these nano-sized letters in silica and shaping these even smaller letters from DNA strands. But growing a nano-logo? That's probably a first on campus. "It's a really fragile structure at this point – blowing on it or touching it would destroy it," Davis said. "We developed a process to coat and strengthen the tubes so that we can make microstructures that have practical applications." Another student, Jun Song, used the process to make devices that quickly and neatly separate the various chemicals contained in a solution. The technique is detailed by the BYU physicists in a new study published in the scientific journal Advanced Functional Materials ("Carbon-Nanotube-Templated Microfabrication of Porous Silicon-Carbon Materials with Application to Chemical Separations"). As demonstrated in the paper, their approach using carbon nanotubes is more precise than current chemical separation methods because it gives more control over the channels that the fluids flow through. That's why the company US Synthetic purchased the commercial rights from BYU. Designing little logos and separating chemicals isn't all the BYU researchers are doing, either. They're also building several kinds of micro-machines including actuators, switches and humidity-detecting cantilevers. Next on their agenda is to create filtration devices. "The technology is moving in a lot of directions," said Davis.